Dharmakaya (Skt. dharmakāya; Tib. ཆོས་སྐུ་, chö ku; Wyl. chos sku) — ‘the Absolute or Truth Body’. Upon the attainment of buddhahood, enlightenment manifests at three levels, which are known as the three bodies of the Buddha: the Absolute or Truth Body, or dharmakaya; the Enjoyment Body, or sambhogakaya; and the Emanation Body, or nirmanakaya. 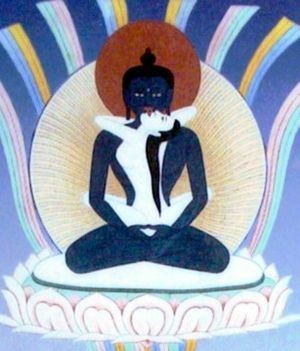 Absolute nature is the dharmakaya, the ‘empty’, unconditioned truth, into which illusion and ignorance, and any kind of concept, have never entered. 'Dharmakaya' is also the eighth of the eight topics of the Abhisamayalankara. See Resultant Dharmakaya. Thinley Norbu, The Small Golden Key (Shambhala Publications, 1999), ‘14. Dharmakāya’. This page was last edited on 20 August 2017, at 04:24.